...3 May Bistritz - left Munich at 8:35 PM on 1st of May and arrived in Vienna early next morning... (Jonathan Harker’s Journal). As far as I know this is the beginning of the legend as it was written in the famous Dracula novel by Bram Stocker. In fact, everything began in 1456 when Vlad Tepes (member of the Basarab dynasty) ascended to the throne of Wallachia with the help of Iancu of Hunedoara, the governor of Transylvania. 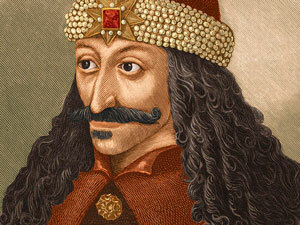 The name of Dracula came from his father, Vlad the II Basarab who was member of the Knights order of the Dragon which fought against the Ottoman Empire. Because this Romanian prince, the son of Mircea the Great was very proud about his membership of this order, he wore around his neck the coat of arms of this order, a dragon. Because in our mythology the image of the dragon is considered to be the image of evil, he was called by the people Vlad Dracul (dracul = devil) and his son, Vlad Draculea which means „the son of the devil“. He arrived in Wallachia after a long period of study at the court of The Sultan. There, he learned everything about the way of life, how to fight and about the organization of the Turkish army. Amongst other things, he also learned about the punishment of impalement, which in fact was used historically and widely in these parts of Europe. When he took the throne he discovered that the country`s economy and foreign policy were a disaster. As a result he started to re-organize the country. First he attended to commerce and the economy, signing agreements with the German merchants from Sibiu and Brasov, who had a busy trade with the Romanian Country. Then he started to bring order to the country by giving a single punishment for crimes: death by impalement. In this way, in acouple of months he managed to reduce criminality and order was enforced. Because the treaty with the German merchants wasn’t very convenient for them, they started breaking it and selling in the Romanian Country products which were made here too. In this situation, Vlad, after many appeals to them to respect the agreement,entered Transylvania and inflicted many human and goods losses in the German cities of Brasov and Sibiu. Because of that and his punishment by impalement, stories about his cruelty started to circulate all over Europe. As you imagine those stories passing mouth to mouth with every person adding a little bit and in this way he became a real vampire in the collective memory. Another thing which he is famous for, is the night attack in 1462, against the Ottoman Army camp. He attacked the camp with 100 soldiers dressed up in Turks uniforms which created confusion, disorder, as well as a diversion while he was trying to kill the Sultan in his sleep. Unfortunately the Sultan was in his lover`s tent at that moment. So Vlad and his army pulled back leaving the Turks to kill each other, because they didn't know anymore who is Romanian and who is Turkish, all being dressed similarly. After this event he was captured near Bran Castle by the men of King MatyasCorvinus of Hungary, the son of Iancu of Hunedoara who helped him take the throne in 1456. He was arrested because of a false denunciation which said that he plotted with the sultan against the Hungarian king. He came back after 12 years but was killed after 3 months. He is buried, or he is supposed to be buried on the island in Snagov Lake, near Bucharest. In fact, if you ask me, he is not buried there because he is still alive! The Dracula novel was written by Bram Stocker with some information that he had from a friend of hiswho travelled in Transylvania. 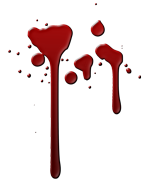 From his friend`s stories he obtained the image of a country with a perfect landscape for a vampire story. Bram Stocker was also writing about the Hungarian countess Elizabeth Bathory who used to take baths in virgins blood to maintain her youth. So he combined the two characters, Countess Bathory and Dracula who had the perfect name for a vampire and was male, and wrote a very succesfull novel.